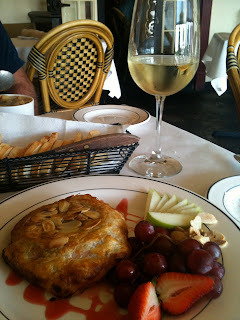 In keeping with the celebration of Paris in July, hosted by Thyme for Tea and BookBath, somehow my husband and I actually found a cute French bistro in our quiet North Florida town. 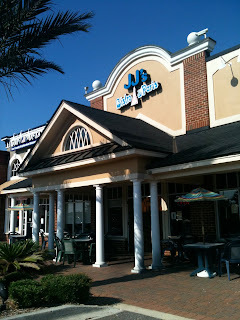 We had decided to go out to eat yesterday, and I was so excited to visit J.J.'s Bistro de Paris off of Gate Parkway. My husband is originally from Boston and I'm from Baltimore, and we've only lived in this area for a little over 3 years, but it wasn't until this weekend that we found such a secret, and that would also mix well with the Paris in July challenge. J.J.'s Bistro de Paris was everything we were needing it to be -- it was quaint and reminiscent of all thing Parisian when we walked in and were greeted by a small store selling French wine and other items, past the bakery counter, and were then led back through the dining area which had an almost 20-foot reproduction of the Eiffel Tower. We chose to sit in a small room off of the main area that had about 8 small tables in it, which reminded me of Europe's small cafes and restaurants, the walls decorated with fab artwork that were Paris-inspired. I truly didn't anticipate that we would actually do a full dinner with appetizers, entrees, and dessert, but the atmosphere was so fantastic, that we just wanted to stay a little bit longer! Our wonderful and helpful waiter, Glenn, helped me select a specific wine that would suit my natural tendency to only drink sweet wine, without it being too sweet. 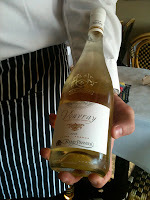 He suggested Vouvray, a lighter wine that held more of a taste of honey and fruits, particularly apple. I selected the Vegetarian Trio entree, which was a Mushroom Risotto, the chef's daily ravioli, and pesto grilled vegetables, while my husband enjoyed his Shrimps and Scallops served with a hazelnut cream sauce and risotto. The presentation of the food was fantastic, and we were stunned by how much food was actually on our plates -- oh yes, we had to get a take away box! The flavors were unbelievable -- we continued to talk about how surprised we were to find this little nugget of a secret in North Florida. Dessert was a lemon coconut cake with toasted coconut on top, and it was *the* perfect dessert for a hot summer evening after a full meal. The combination of the toasted coconut with the light sponge cake and cream filling, along with an almost wafer-like bottom was wonderful, and it capped the evening off perfectly. My husband and I left the restaurant feeling as thought we had just spent one night in Paris! Thank you to all of the staff at J.J.'s Bistro de Paris, our waiter Glenn, and especially the amazing chef, James-- it was absolutely wonderful and we thank you all! It will not be long before we would like another jaunt through Paris again! I am so very hungry after reading your post and seeing those pictures! Oh my goodness how delicious everything looks! And how perfect to go along with your Paris challenge for the month - way cool! I was honestly so very surprised that we found this place -- and the food was unbelievable! I am sure we will find a way to visit this restaurant again, and very soon!! Looks great! I die for brie--especially with fig jam! SogniSorrisi -- Yum, fig jam? Sign me up! What a super cute restaurant! I love the pictures too! I can't wait to see your posts when you're in Key West! Ooh, Estela, I am ready to head to Key West! Should be a blast, now I'm trying to see what books I should take with me on the trip! Tamara, it was fantastic! I'm going to have to figure out a way to come back to this spot a little more regularly to have my French food again!